Well I put together a scrap layout of my favorite subject...my Tucker. This was 3 years ago when he was a teeny tiny puppy. He was so cute! He's still absolutely adorable although I may be a bit prejudice as his mommy, but I do think he has THE sweetest little face. Anyway, the first photo shows him visiting his gampa in the hospital after his gallbladder surgery cheering him up. He sure does love his gampa! And the second photo shows him napping with his favorite stuffed toy, Lamb Chop lol! I mixed some of my Project Life for Stampin' Up! 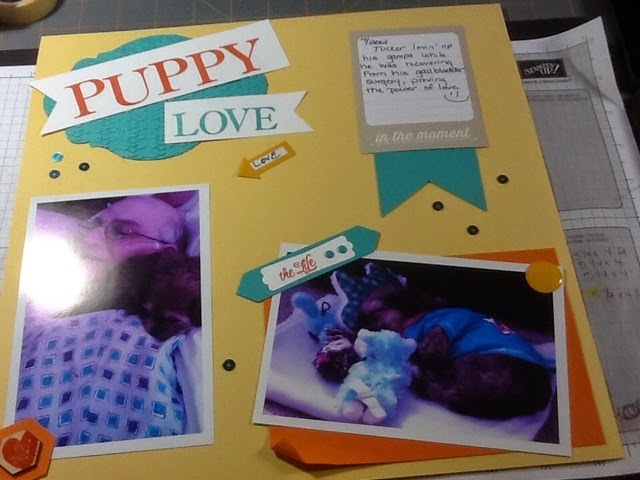 with traditional scrap booking. I used some retiring product as well like the Argyle embossing folder. I'm really liking the Daffodil Delight mixed with Bermuda Bay and Tangelo Twist, I think the colors really pop together. What do you think? I added some of the Bermuda Bay sequins for a little "glitz" and I stamped the heart from the Work of Art stamp set onto the 6 sided shaped wood veneer with the Tangelo Twist ink and layered it onto a 6 sided punched Tangelo Twist piece. I hope this inspires you to mix up your supplies and just have some fun preserving your memories.